In his 20-year N.F.L. career, Junior Seau established himself as one of the game’s greatest linebackers. He committed suicide in 2012 at age 43 and was subsequently found to have had a degenerative brain condition linked to repeated hits to the head. 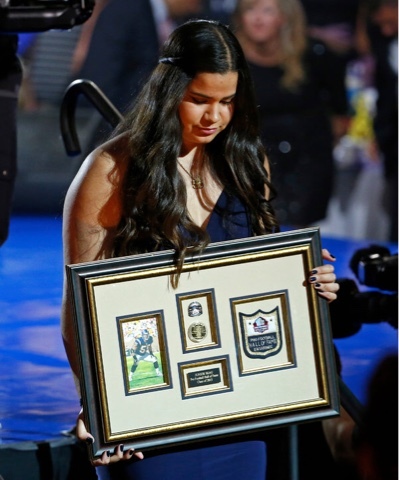 Before his death, Seau told his daughter Sydney that she should speak on his behalf if he made it into the Pro Football Hall of Fame. But the Hall, citing a five-year-old policy of not letting others give full speeches for deceased inductees, did not allow Sydney to deliver her speech. First off, I would like to thank the generous people of Canton, Ohio, for opening up their homes for this event, the Pro Football Hall of Fame committee for voting my father into the Hall, and of course the other seven deserving inductees. Before I start thanking communities, teams, family and friends that I do know and many others that I have yet to have the pleasure of getting to know, I would like to say that this is not my speech to give. This speech was meant for a man that worked 20 years within the sport he loved most in this world. I cannot speak for him because I am not him. I have not played in the N.F.L. for one second, let alone 20 years; I do not have past seasons to reminisce about or hilarious locker room stories to joke about. But I do have one thing, and that is unconditional love. Your Junior Seau, your No. 55 and your buddy, was also my father. And although I didn’t know every aspect of his life, I did know one particular part very well. His athleticism and talent made him extraordinary enough to make it into the Hall, but it is his passion and heart that make him truly legendary and deserving of this tremendous honor. Tonight I would like to honor him and his legendary heart. The two words that exemplify my dad the most are “passion” and “love.” Everything he achieved, accomplished or set his mind to was done with both qualities. In every situation — whether it be practice, a game, a family barbecue, an impromptu ukulele song or just a run on the Oceanside Strand — he always gave you all of himself because to him, there was never any other option. I would like to think that his selflessness and ability to love unconditionally were instilled in him by his family. Nana, Papa, all my aunts, uncles, cousins, mother and brothers who share the Seau name, I know that he would say that this honor is also yours. You all were the motivation he needed to become a success. He wanted nothing more than to make you all proud, and I hope you know that without you he wouldn’t have been the man, the player or the father he was, and for that, I also thank you. Being the first Polynesian and Samoan to make it into the Hall of Fame is such an accomplishment. He is proof that even a young boy from Oceanside can make his dreams a reality. All his success is a direct reflection of the Oceanside community and family that raised him and molded him into the man he became. Although he is the first Polynesian to make it into the Hall, I know he will not be the last. San Diego, you are and always will be home. You have embraced my father with open arms and allowed him to carry on his athletic career, but more importantly the Junior Seau Foundation. In my mind, one of his greatest achievements was being able to give back to the community and home that gave him everything. Looking back, it’s unbelievable because my father was an Oceanside Pirate, a U.S.C. Trojan, a Miami Dolphin, a New England Patriot, a San Diego Charger, and now he is, and forever will be, a Pro Football Hall of Famer. I think it’s safe to say that he has most definitely made it. Even though he would never admit to retiring, I think this is the perfect final graduation. I say final graduation because in 2006, instead of retirement, my dad decided to graduate from being a Charger after 13 years. Today is the day he graduates from the game itself. I think the point is, he could never fully retire from this game because that would indicate that he was quitting and you can’t quit something that is a part of who you are. Instead he graduates, and this is the diploma he has always dreamed of. What keeps coming to mind when I think of him is the fact that he was basically superhuman. On the field he was relentless, hard-hitting, passionate and unstoppable. Off the field he was caring, gentle, hilarious and generous. On top of that he played within the league for 20 years, and that in itself is pretty exceptional. May 2, 2012, we all endured a loss. Thousands lost their all-time favorite linebacker, hundreds lost their favorite Charger, tens lost their buddy, and four lost their father. The reason why this honor is so hard to accept is because we had always envisioned him still being here to accept it. But something that we all cannot deny is that we are all still here. We can keep working today, we can keep building our tomorrows, and we can keep praying for the rest. This superhumanlike man truly blessed us with one of the most precious gifts he could have given. He gave us his time. With that time, I know he made one hell of an imprint on my life, and from the amount of emotion and love in this room, I think we all could say the same. Something that is hard for me to admit to myself and to you all is the fact that I miss his singing. I miss his huge mangled hands strumming on his uke, playing the only five chords he knew, to the hundreds of songs he would attempt to sing off-key. I miss him calling me Beau, my girlie middle name, and I miss him hugging me too long and too tightly, almost to the point where I couldn’t breathe. Yes, I witnessed his career and accomplishments as a pro athlete, but what I remember most is the way he made me feel. I can honestly say that he made me feel like I was the most important person in the world. The reason why I think he wanted me to present him is because I didn’t know his athletic career but I did know his heart, and I’m blessed to say that I felt his love for 18 beautiful years, and I still feel it to this day. Dad, you gave us your time, your presence, your love, but most of all you gave us your heart. For that we honor you with this induction and this final graduation. I know at times it seemed as if everything you accomplished in life wasn’t enough, but today and every day since you held me in your arms for the first time, you weren’t just enough; you were more than enough. In fact, you were everything. Well, after this speech, I hope you can hear us when we say that we love you, and I hope that this induction can exemplify the fact that you were more than just Junior Seau — you were a light, and you’re still mine. This is your speech, your moment and your honor, and to say that I’m the most proud daughter on Earth would be an understatement. Congratulations, Dad; you made it.